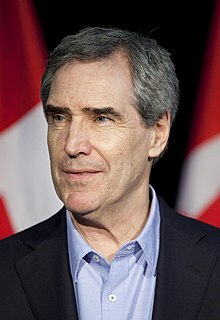 Michael Grant Ignatieff (born 12 May 1947, in Toronto, Ontario) is a noted Canadian scholar, novelist and former Liberal Member of Parliament in the Canadian House of Commons. He also was the leader of the party from 2008 till 2011. To defeat evil, we may have to traffic in evils: indefinite detention of suspects, coercive interrogations, targeted assassinations, even pre-emptive war. The difference between us and terrorists is supposed to be that we play by these rules, even if they don't. No, I haven't forgotten Hiroshima and My Lai. The American way of war has often been brutal, but at least our warriors are supposed to fight with honor and can be punished if they don't. There is no warrior's honor among terrorists. It was Reagan who began the realignment of American politics, making the Republicans into internationalist Jeffersonians with his speech in London at the Palace of Westminster in 1982, which led to the creation of the National Endowment for Democracy and the emergence of democracy promotion as a central goal of United States foreign policy. Until George W. Bush, no American president -- not even Franklin Roosevelt or Woodrow Wilson -- actually risked his presidency on the premise that Jefferson might be right. But this gambler from Texas has bet his place in history on the proposition, as he stated in a speech in March, that decades of American presidents' excusing and accommodating tyranny, in the pursuit of stability in the Middle East inflamed the hatred of the fanatics who piloted the planes into the twin towers on Sept. 11. If democracy plants itself in Iraq and spreads throughout the Middle East, Bush will be remembered as a plain-speaking visionary. As a former denizen of Harvard, I’ve had to learn that a sense of reality doesn’t always flourish in elite institutions. It is the street virtue par excellence. Bus drivers can display a shrewder grasp of what’s what than Nobel Prize winners. The only way any of us can improve our grasp of reality is to confront the world every day and learn, mostly from our mistakes, what works and what doesn’t. Yet even lengthy experience can fail us in life and in politics. Experience can imprison decision-makers in worn-out solutions while blinding them to the untried remedy that does the trick. Getting Iraq Wrong, The New York Times, August 5, 2007. Ever since I entered Parliament in January, people have been asking me: Why have you gone into politics? As in: “Are you nuts?” No, I’m not nuts. This is my country, after all. I’m in politics to speak up for a Canada that takes risks, that stands up for what’s right. A Canada that leads. I believe in Canadians. I believe in you. As I said at the beginning, we are a serious people. There is only one thing we can do about this: live the way we are supposed to live, as our Constitution commands us to, with dignity and respect for all. Being an American is not easy. It is hard. We are required to keep some serious promises. We are judged by a high standard, one we crafted for ourselves in the founding documents of the republic, the ones that talk about the equality of all people, the ones that tell us that government is of the people, by the people and for the people. We need to live by this, at home and abroad, and it is just about the only thing we can do to face the hatred of those who want to destroy us. Our best defense is to stay true to who we are. Our best defense is to refuse to live in fear, of them, of ourselves, of anyone. We are living a moment of truth in Iraq, a moment in which we have to look fair and square at disagreeable realities, in which we have to look at ourselves. The pictures from Abu Ghraib prison are a kind of mirror in which we have to look at ourselves and ask: what kind of people did this? How did this become possible? Could I have done a thing like this to those people? We do need to ask ourselves, as a society, as a free people, how we came to this pass. Those soldiers were acting in the name of America, and they disgraced its name. We have to ask who authorized them to do so. Who should take responsibility here? We need answers to these questions, and we need to take responsibility as citizens that we get answers, and that accountability is established, right up the chain of command if need be, so that we do not go here again as a country. Some voices are calling on America to circle the wagons. Some are even saying that our enemies do worse, so we should respond in kind. The problem here is that this is America. This is a constitutional republic based on the rule of law and equal respect for all persons. We can’t pretend that we can bend the rules any which way. We made the rules for ourselves. We have to live by them. As Interim Leader of the Liberal Party of Canada. Coalition if necessary, but not necessarily a coalition.